There are certain plants that people will always ask about when they visit. They aren’t always fancy plants – like the rose campion (Lychnis coronaria) that spreads itself around my garden without help. But in spring when it bears magenta flowers on silvery soft foliage, people are entranced by it. 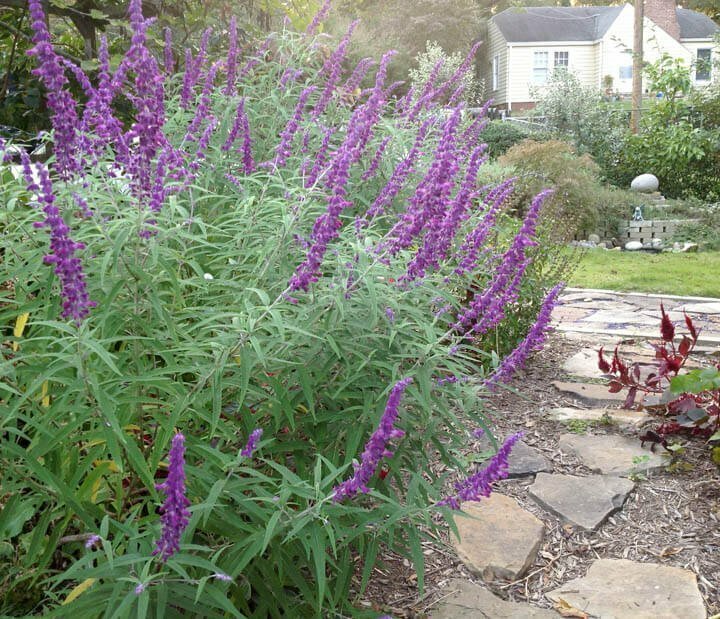 In the fall, nearly everyone who walks in my door asks about the Mexican bush sage (Salvia leucantha), a true specimen plant that grows 4 feet tall and wide in one season and has long drooping blue flower spikes that last until frost. It’s a hummingbird and butterfly magnet. Mexican bush sage is one of 900 or more species of salvias that have been identified from both the Old and New Worlds. As part of the Lamiaceae family, they have the identifiable square stems but what sets them apart is their unique pollination mechanism. There are only two stamens, not four, and when the pollinating insect dives in for nectar, it triggers a lever-like structure and pollen is deposited on its back. This mechanism ensures pollen movement and may account for some of the amazing diversity in these species: there are annuals, perennials, varying colors and sizes, edibles, medicinals, and spectacular ornamentals. When you start talking about salvias, it can get confusing because you often hear sages and salvias used interchangeably. All sages are salvias, but sage is most often used when talking about culinary or medicinal species, whereas ornamentals are usually referred to as salvias. The name salvia comes from the Latin word “salvere” which is to “feel healthy, or to heal” and was first mentioned by Pliny the Elder, who in Roman times was most likely talking about common garden or culinary sage (Saliva officinalis) which has a wide range of medicinal properties. Even though Mexican bush sage is a tender perennial here in the Piedmont, it is one that I always purchase (as a tiny plant) in anticipation of its fall splendor. I have had them live through the winter on occasion but usually they do not. After all danger of frost is well past, find a sunny, well-drained location for this plant, remembering that it will grow fast once it gets going. Mulch will help it get through dry periods but it’s fairly tolerant like most salvias. Pinch the stems back a few times for a bushier habit and once it starts putting on flower heads in August or September just step back and admire. Bedding Sage (S. splendens)-range of colors, 1-2 feet. Pineapple Sage (S. elegans)-attracts hummingbirds, aromatic leaves, 3 feet. Mealycup Sage (S. farinacea)-moderately hardy, 2 feet. Scarlett or Texas Sage (S. coccinea)-2-4 feet. Painted Sage (S. viridis)-2 feet. ‘Black and Blue’ (S. guaranitica)-insects love it, watch out-it’s aggressive, 3 feet). Common Sage (S. officinalis)-edible, blue flowers, 1-2 feet. Autumn Sage (S. greggii)-great summer bloomer, 1-3 feet. Eyelash Sage (S. blepharophylla)-moderately hardy.